An addiction is an addiction. Most think that having an addiction is a heavy violation of substance abuse which raises health concerns, while draining morality. Addiction is defined as a fact or a condition of being addicted to a particular activity, substance, or thing. Realize social media is an activity. What Facebook gives us is everything we’ve ever wanted. What it allows for is the ability to easily keep in touch with school mates, long lost friends, relatives and acquaintances, all instantaneously with a click of a button. No more trips to the post office or long distance phone calls. A smorgasbord of needs, fulfilled. But like any other benefit of life, what Facebook has is a psychological cost to pay, most being intangible. One residue, a fault that is the convenience of Facebook, is that users eventually experiences decreases in subjective well-being. It can make one feel that they’re failures in life, when compared to those more spectacular than they are, as we humans are creatures of social comparison. The need to ask whether, “Am I doing better or worse than my peers?” So what one does is checks out others, who are similar to them. Facebook provides a quick “stalking” way of effortlessly engaging in social comparison. 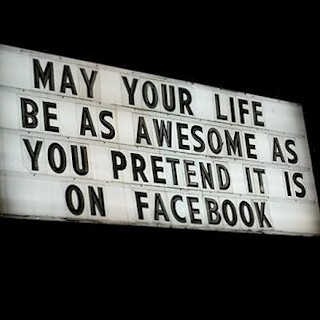 Just one glance at your newsfeed, allows you to see pictures of your friends “frolicking” about. Chronic users of Facebook, will then tend to believe that others lead happier lives than they do, making them think that life isn’t fair. Someone you know recently gets a promotion at work, gets married, had a baby, just bought a new car, posted photos from their latest vacation. What you don’t secretly feel is the same happiness that they do, but instead you feel envious of their success, their happy lives, one you can’t measure up to. What’s found is there’s a negative psychological buildup, this by passively following others on Facebook, as feelings of inferiority festers, this from skimming through their profiles. Know that your digital movements are traced, every keystroke is tracked and recorded. So even if you enter the same keyword search query in Google that your friend does, what you’ll both get are different results, this based on your tendencies and behavior. Facebook has similar sorting functions, which determines the posts you see on your newsfeed, which may alter or distort your world view. The posts are tailored to show you favorable biased results, this based on what you like or believe. Facebook allows you keep in touch with those you want to avoid. What curiosity does is allows you to “stalk” what your ex is doing, as Facebook discretely provides the perfect platform. What you’re secretly hoping for, is that they’re as miserable as you are. Was that ambiguous post that they posted directed at you? Are they now dating that former schoolmate? These and other questions may often be better left unanswered, yet you pry. What’s known is that Facebook users who visits their former partner’s page, disrupts their emotional recovery process, causing higher levels of distress. Then once you run into your ex in real life, because of your online surveillance, your viewpoint becomes distorted. Facebook stalking doesn’t just apply to your ex, but extends to all your relationships. Why is she always “liking” everything he posts, but never “likes” my posts? Checking up on your partner, your friend or foes timeline, can often lead to jealousy or unwarranted suspicion. So what needs to be discussed with your partner, are the behaviors that you both consider safe and trustworthy, setting boundaries where you both feel comfortable. What’s available is information that you might not want your potential employer to see, such as how drunk you got last Friday night, and were “tagged.” What most will reveal is their “party” side on their Facebook page, for all to see. What’s often thought is that these posts are safe from prying eyes, but that’s not always the case. What’s also known, is that everyone has some type of social media presence. Most popular social media sites, has now become a resource where potential employers will actively search for potential hires. So if you’re on the job market, make sure that you check your privacy settings, and restrict all the risqué content to “Friends Only,” if you’re not wanting to delete anything. Society’s most traditional addictive substances include coffee, cigarettes, and alcohol. The most common of the millennial age is Internet addiction, especially its evil step child social media. Facebook addiction is rapidly generating traction, this to the point where experts have developed a Facebook addiction scale, a measurement of the degree of seriousness that ones addiction is. To measure this, participants were randomly texted over a period of time, on what they most craved at that particular moment. What they found, was that social media usage was coveted the most, this more than tobacco or alcohol. Things aren’t all that bad however, as what research has revealed is that Facebook decreases ones loneliness or boredom, while allowing the user to find and monitor their place in the world. It keeps everyone up to date, helps keep everyone in touch with others. Those who constantly posts their status updates, news, or memes, led to increased feelings of social connection, leading to lower levels of isolation. Social media is similar to other technological breakthroughs, such as the invention of the automobile. It depends on how safe you drive, or how frequently you decide to go online.